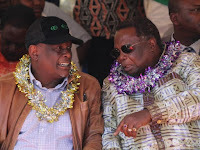 Thursday December 27,2018 - Jubilee Party Vice chairman, David Murathe, has said President Uhuru Kenyatta will not endorse Deputy President William Ruto's presidential bid in 2022. Speaking during the Maragoli Cultural Festival held on Wednesday in Mbale, Murathe who was the chief guest said Kenyans should not be hoodwinked into thinking that President Uhuru Kenyatta will support Deputy President William Ruto in 2022. “Let you not be deceived by the Tangatanga movement because both Ruto and Uhuru have served their full terms and should retire together," Murathe said. He also said Ruto should not 'pretend' to be speaking on behalf of Jubilee on matters of the referendum saying there was need to change the Constitution so that it can be more accommodating. “We don't want a Constitution where the winner takes it all; it's always a recipe for post-election violence," he said. Bungoma Senator, Moses Wetang'ula, said the Luhya community is united and will prove the naysayers wrong in 2022. "Nobody can stop an idea whose time has come; we are united like never before like Siamese twins," he said. Wetang'ula said the top Luhya leadership is seeking to form alliances with other communities in order to clinch the presidency in 2022.